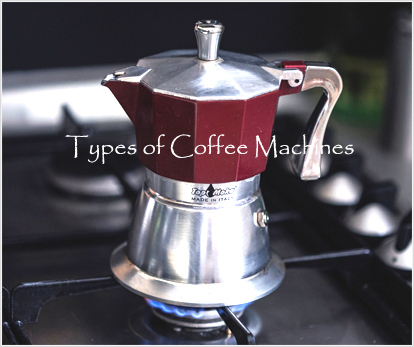 Ever wonder what are the different types of coffee machines? Well, you’ve come to the right place for a quick overview of different coffee machine types. There are many types of machines including, Manual Espresso Makers, Automated Espresso Makers, Moka Pots, Single Serve Coffee Makers, and so on; however, we’ll only cover several of them on this page. What is a percolator? What does it do? Welp … the Percolator is one of the mostly commonly used coffee makers. The Percolator is similar to the French Press, just with a pot at the bottom which can be heated on a stove top. This coffee maker can brew your coffee and it usually tastes unique, depending on the type of coffee used. What is a drip coffee maker? Good question, it's simple a basic (really basic) coffee machine that’s pretty much found in almost every home. The drip coffee maker is typically a black coffee maker and has a black-chrome color style... (at least I think it is...), which allows you to insert a coffee filter, add a bunch of teaspoons of ground coffee, pour water, then press start and watch the magic begin. For this type of coffee maker, you want to find a finer grind to start off with, which depends on the filter type you plan on using. What is an espresso coffee maker and how is it used? Welp... the espresso coffee maker is easy to use and its automatic (not for sure...). It’s used to make coffee (of course) and many people use this coffee maker because its automatic and it’s far more convenient over the drip coffee machine. Same concept applies though. What is a French Press? Why is it called French press, and not an Italian press or British press? Well, the French press is simple coffee maker that allows you to press down on a knob (not an actual door knob) to make your coffee. Hence, the word press. I’ll give it away why it’s called a French press... simply because, according to Wikipedia, it was “invented by Paolini Ugo and patented by Italian designer Attilio Calimani and Giulio Moneta in 1929”. In other words, cool dudes from the stone age. What is a Vacuum Coffee Maker? How does it look? Well, it’s basically a coffee maker that looks like some sort of mad-science laboratory equipment. The vacuum coffee maker is a fancy looking coffee maker and it is known for its unique shape. This coffee maker is mostly made of glass, and looks like a funny sand timer, which “brews coffee using two chambers where vapor pressure and vacuum produce coffee”, according to Wikipedia.